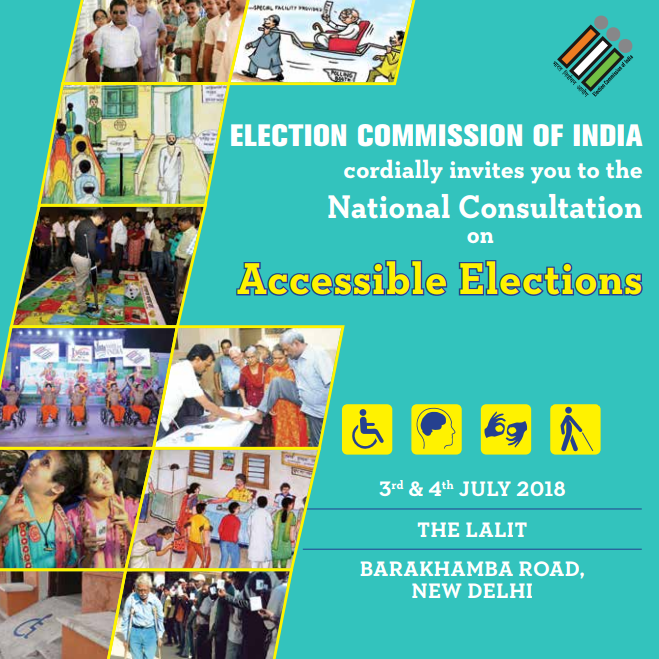 On 3rd and 4th July 2018, the Election Commission of India organized a National Consultation on Accessible Elections at ‘The Lalit’, New Delhi, wherein all the 36 Chief Electoral Officers and representatives from Civil Society Organisations, working in the field of Disability deliberated upon ways and means to make elections completely accessible to Persons with Disabilities. The two-day Consultation was also attended by representatives of national political parties and senior officials from Ministries apart from notable media organisations. Ahead of the National Consultation, a series of Consultations with the stakeholders were conducted in Districts and States across the country to identify the existing barriers and challenges, assess the implementation of the directives given by Commission on the subject, consolidate and gain from good practices (including innovations and technological support) and for further engagement with the stakeholders. The reports of the Consultations from the States were documented into the Consultation Reader and the same were carefully assessed and analyzed in the National Consultation. 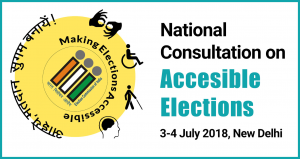 Recommendations of the National Consultation would pave the way for a policy document on ‘Accessible Elections’ and action plan for the upcoming elections. To make elections accessible to persons with disabilities, efforts have been taken up in past years. A well designed framework of guidelines has been directed by Commission for facilitating PwDs at every step in the electoral process. 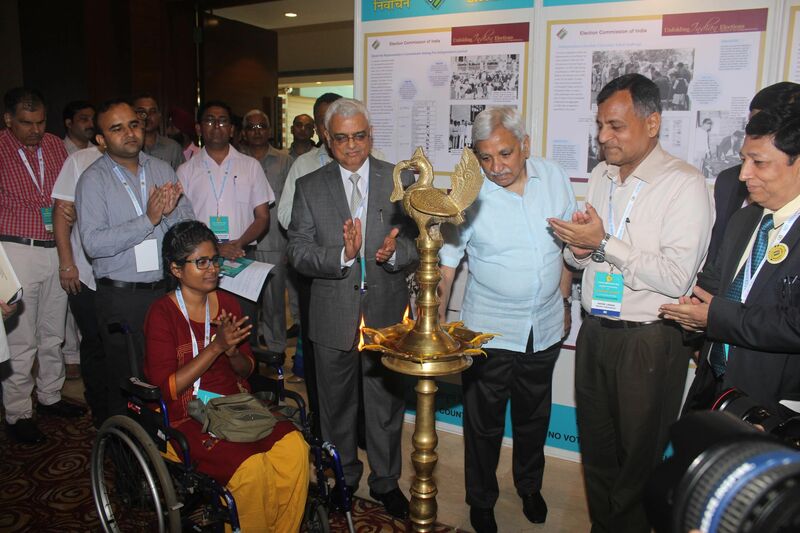 Many States and Union Territories have done exemplary work for overcoming the barriers and creating accessible and friendly environment for PwDs. The International Conference on ‘Inclusion of Persons with Disabilities (PwDs) in Electoral Processes’, held in January, 2018, aided to consolidate and gain from international experience. Prior to this, the Commission's resolve in support of inclusion of PwDs has also been conveyed through official directives dated March 12, 2016 and September 7, 2016. The first day of consultation also witnessed the launch of new dynamic website for ECI’s SVEEP (Systematic Voter’s Education and Electoral Participation) Division with a dedicated section on PwDs and state of the art security and accessibility features. 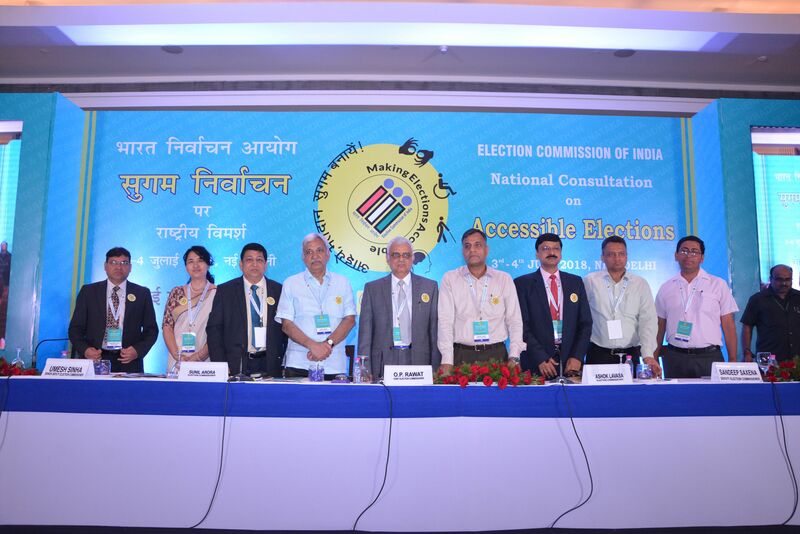 The first technical session commenced with a presentation by the Department of Empowerment of Persons with Disabilities, Ministry of Social Justice and Empowerment followed by the presentation of Best Practices on Accessible Elections by the Chief Electoral Officers of Karnataka, West Bengal, Gujarat, Himachal Pradesh, Uttarakhand and Meghalaya and District Election Officer of Mandya, Karnataka. Post lunch, the participants of the National Consultation were divided into five groups, for discussions under the second technical session, to cover specific disabilities. The groups read through the reports submitted by States/UT and assessed barriers, challenges specific to the disabilities; studied existing initiatives, took inputs from the participating CSOs and came up with findings and recommendations for thematic presentations. 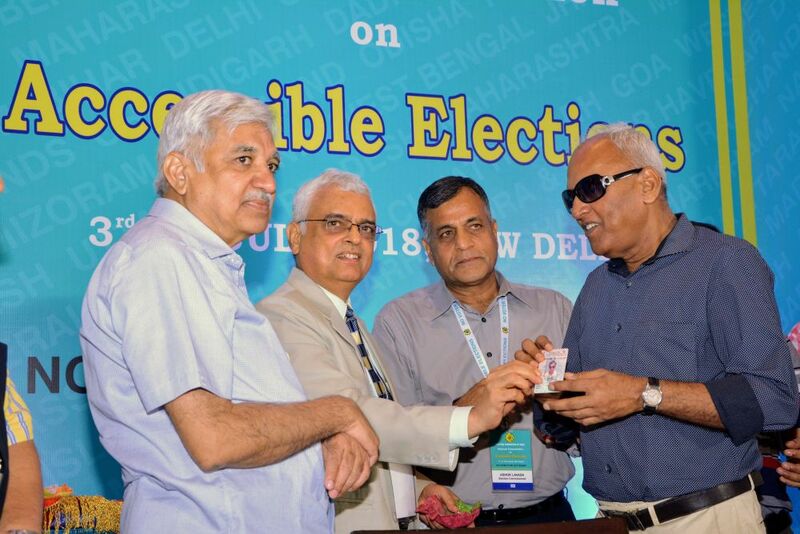 The Closing Session of the National Consultation on Accessible Elections was graced by the presence of Hon'ble Chief Election Commissioner Mr O. P. Rawat, and Election Commissioners Mr Sunil Arora and Mr Ashok Lavasa. The Commission announced the following measures for the facilitation of PwDs. 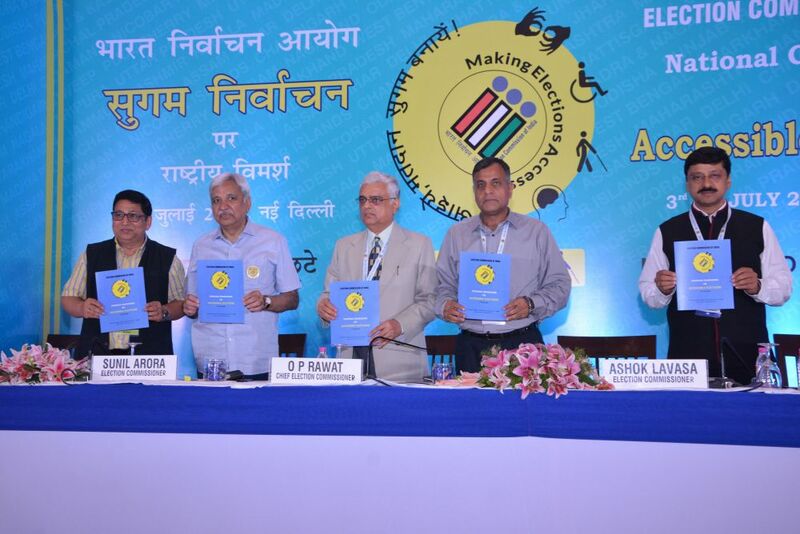 The deliberations held during the two day consultation resulted in a comprehensive, “Strategic Framework on Accessible Elections” which will help in making electoral process more accessible in the forthcoming State and National Elections. It would be a significant step in pursuit of Election Commission’s mission to leave no voter behind. 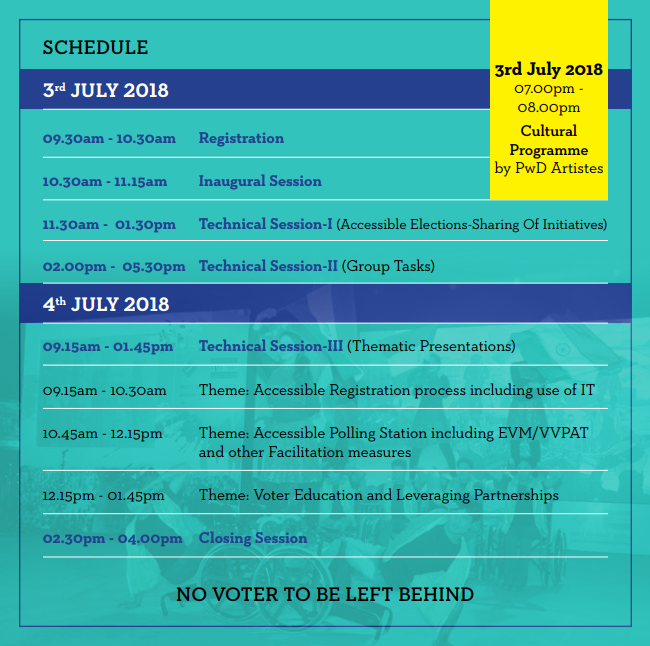 The Strategic Framework on Accessible Elections is built around sensitization through education and training, community involvement of different sections of society, effective partnership with institutions and origination and creation of facilities to cater to the specific needs of Persons with Disabilities (PwDs) with a view to increasing their participation.